I got a survey from them I did it and of course, they can't credit me for 24-48 hours. I then got sent a second invite to a different survey from them and clicked on it came back as sorry our records indicate you took a survey today come back again another day to try . Hmm so now its 1 survey a day with them? This seems strange never heard of any place doing this before has anyone else had this happen. 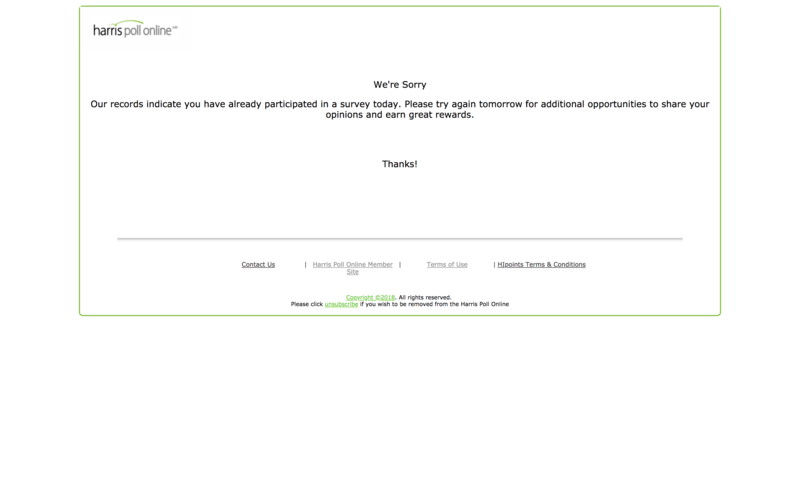 I have had the same thing But I Would get an email for a survey from them and then it would say Ihave already done a survey today and I didn't. They kicked me out when I complained about them to the Bbb- then months and months later they said they were sorry gave me the $5 they owed me and said they would let me start taking surveys again, however they never did.I say good riddance they don't like to pay people for surveys done and if you complain to much they will more then likely kick you out. Does anyone have a contact email to them? I try to send them an email on the contact us page and it says "an error has occurred" and I am unable to send an email. That was what happened to me .And that is why I contacted the BBB and the reason they closed my account is becasue I went to the BBB.Good luck with that one.Not sure how much money you have in your account but if you would like to cash out I say go tot the BBB maybe they will pay you and then more then likely they will close your account.But hey I would rather get paid and say bye to a company who treats their survey takers so poorly then not get anything at all.Or maybe they will treat you better who knows.Good luck with that one. I dropped out from Harris after it became apparent they were throttling my account progressively over 2018. By the end of the year, I was down to zilch and support refused to help with those messages of attempting more than one survey in a day. Support even denied that message occurred and would not respond to the ticket when I attached the screen shot.